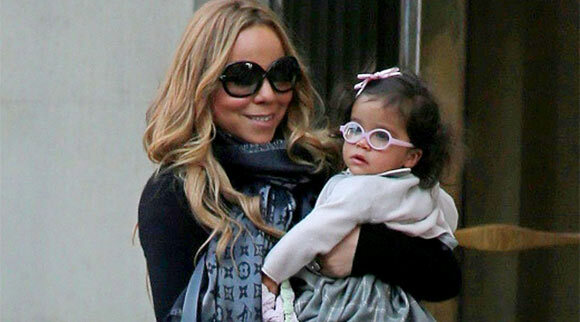 Mariah Carey and her toddler daughter Monroe enjoyed a day out on the town in New York City. The lovely pair were seen on Monday heading to a car on the streets of Tribeca. Mommy Mariah Carey-Cannon was wearing all black, fishnets, black sunglasses and stiletto boots while her twin baby daughter Monroe Cannon, 1, wore a plaid skirt, a cute little collared sweater and a bow in her hair. Lets not forget the cute pink glasses Monroe wore as she carried her bunny rabbit in one hand. It’s uncertain where her twin brother Moroccan was, but we can imagine he was probably hanging out with their dad, Nick Cannon for father-son time.